I wrote about LED Football awhile back. 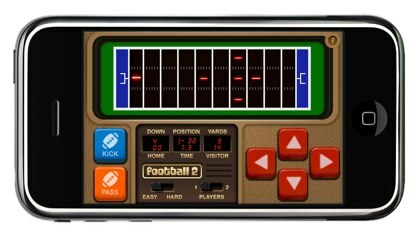 I explained how much I loved that game as it took me back my favorite handheld of all time, my trusty Mattel Football. What I didn't talk about was the sequel, Football 2. This follow up handheld added passing and the ability to run backward. It was like taking your favorite food and pouring on extra chocolate. I didn't have one back in the day but boy did I sure want it. Now you can have it on your iPhone for just 99 cents. I'm trying to figure out if these retro games are just something for people of my generation or if everyone likes them. Regardless, I keep both versions of LED Football on my iPhone at all times. They are both some of my favorite "go to" time wasters. Check it out.